Well.. I'm not really good at making graphics but I want to hear your comments. I think they're really cute. Cute, can't wait to see more. Thank you, but don't u think it's too simple. I want to make some better graphics. I will try. Sorry if I'll fail. I'm sure I will. Maybe I should try to make some wallpapers. Thank yu for your opinion (waiting for more opinions). I like them, you're pretty good at cropping. May I ask what kind of program do you use? Don't worry about simplicity, I like keeping my graphics simple too, but sometimes when I feel very motivated and have more time on my hands I like to go all out and create bigger things. I use gimp and Photo Filtre. Well.. I make graphics when I want to change my icon or signature or when I'm bored. I want to learn more. I would like to join that forum too. But are there toturials for gimp and photo filtre? Something I made weeks ago. I made this banner today. I love your new graphics! 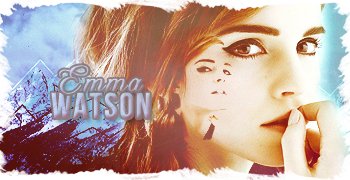 Those are some lovely Emma graphics; I like the coloring on the 2nd one, very vintage. And here's the link to the forum I was referring about. I'm not exactly sure if they have tutorials for Gimp or Photo Filtre, but perhaps they'll have similar tutorials. Those are some lovely Emma graphics; I like the coloring on the 2nd one, very vintage.And here's the link to the forum I was referring about. I'm not exactly sure if they have tutorials for Gimp or Photo Filtre, but perhaps they'll have similar tutorials. It's really nice, can't wait to see more! thank u. I'll upload more. Zayn Malik and Niall Horan from One Direction. yeah. It's simple. I'm so happy you like it.